Armagnac is France’s oldest brandy, with the earliest references dating back to 1310 under the name Aygue Ardente (Latin for ‘water which burns’) and was attributed to healing properties. Production is spread across three departements (Landes, Lot-et-Garonne and Gers) and the production area is split into three regions: Bas-Armagnac, Haut-Armagnac and Armagnac-Ténarèze. These different regions have varying climates, with oceanic influences to the west and a Mediterranean-style climate marked by Autan winds to the east. Awarded an AOC in 1936, Armagnac is an artisan product which has been made in the region since the Middle Ages, obtained by distilling white wine in an Armagnac still and then leaving it to mature in oak barrels for many years. Its wide range of terroirs gives it a unique, distinctive character, and it is made from different grape varieties, of which each stamp their personality on this brandy (Ugni Blanc, Baco, Folle Blanche and Colombard). 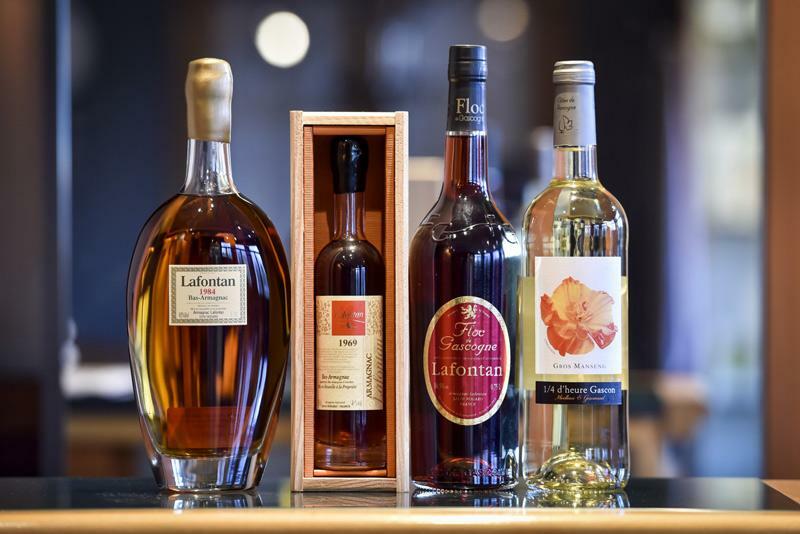 After spending many years in barrels, Armagnac is created as a blend (numerous different eaux-de-vie from multiple harvests), or the Armagnac speciality of a vintage (one single harvest year). The aromas given off by Armagnac develop over the years and there is no sudden aromatic gear change between a VSOP (‘Very Superior Old Pale’, more than four years in oak) and a Hors d’âge (more than ten years in oak). Armagnac producers group these aromas into aromatic families: fruity and floral notes form the aromatic base of a young Armagnac, whilst pastry notes represent the union between the eau-de-vie and oak for an Armagnac more than ten years old. After twenty years, many Armagnacs develop ‘rancio’, a term describing significant maturity in an eau-de-vie. Armagnac’s stunning diversity means that it can be paired with an infinite number of dishes. The Concours des Eaux de Vie du Bas Armagnac Landais competition takes place every year at the heart of Bas Armagnac. Producers present the fruit of their labours across different categories, and these nectars are patiently and carefully analysed blind by a panel of experts. The results of the Concours des Eaux de Vie du Bas Armagnac Landais 2017, held in Mont-de-Marsan on 8 September 2017, can be found here. What about the risk of getting drunk? All you have to do is adjust the measures poured and serve it with a glass of water (for thirst). 300 ml (around three glasses) of a wine at 12% ABV are equivalent to 90 ml of brandy at 40% ABV, or three measures of 30 ml, ideally served in a tulip or balloon glass. ‘Blanche’, or unaged Armagnac, can be served as a trou gascon mid-meal digestif (plum ice-cream and Blanche Armagnac, or a small chilled glass Blanche). It pairs well with smoked salmon, caviar, foie gras, charcuterie or lemon tart. Young Armagnacs are used for flambéing (shellfish, meat, pastry) and sauces. A hint of Armagnac can be used to replace vinegar in vinaigrette for an extra something. It goes fantastically with blue cheese (Fourme, Roquefort). Old Armagnacs go with guinea fowl and fruit, duck breast and honey, or cep omelette. They also go with desserts based around fruit (tarte tatin, pear charlotte, confit orange) or chocolate (Black Forest gateau, chocolate mousse). Alternatively, special desserts such as an Armagnac baba served with a 20 ml glass of Armagnac, or a pancake with Pousse Rapière liqueur. The sweetness of dessert softens the liveliness of the brandy. This pairing highlights the aromas of a mature Armagnac (such as oak, toasted, roasted, smoky, coffee and cocoa notes), matching the aromas of coffee very well. An old Armagnac with refined aromas will enhance the delicacy and finesse of a Kenyan coffee, and a young, lively Armagnac will make a powerful partner to a coffee from Ethiopia. The bitterness of coffee ‘erases’ the acidity of the brandy and boosts the impression of smoothness. A menu might even offer a café gascon: 20 or 30 ml of Armagnac served with a coffee as a digestif. It is also worth remembering Armagnac’s digestive benefits. You could offer two 20 to 30 ml tasting measures at the end of a meal to demonstrate the diversity which Armagnac has to offer. And for cigar fans, putting these two together is a match made in heaven.